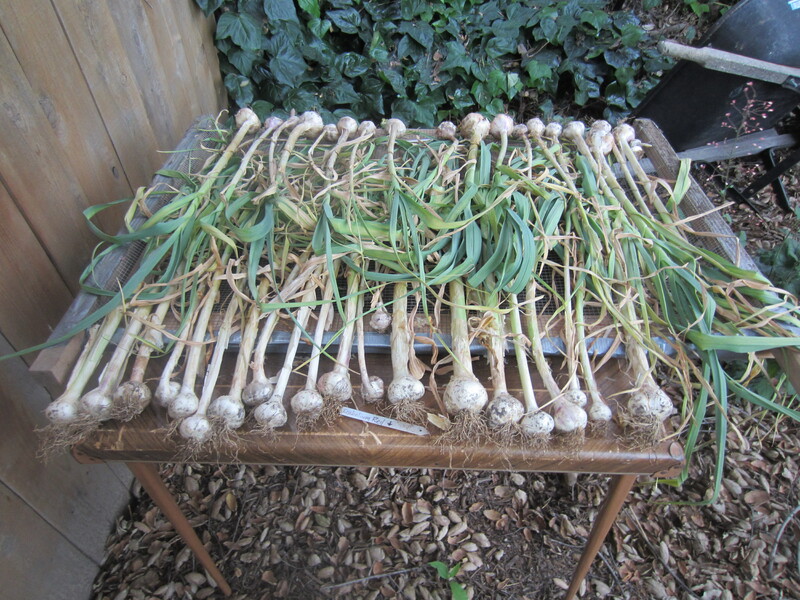 Pulling up garlic may be my favorite task in the garden. Maybe, it is because garlic takes time, a lot of time. I plant the cloves in late October and harvest does not come until the end of May. Maybe, it is because it smells so good, the stalks and bulbs letting go of a bit of their essence as they are tugged and yanked from the ground. Maybe, it is because I know the harvest will last us most of the following year. Pulling up those bulbs is so incredibly gratifying. 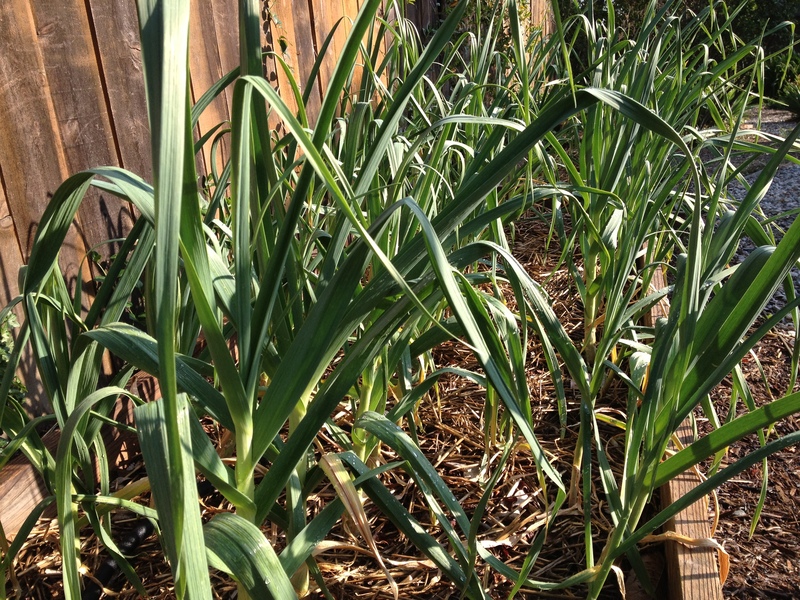 This is the garlic about six weeks ago, before I started to let it dry out. The harvest last year, due to being pregnant, then caring for a newborn, was very poor. Most of the bulbs were very small. They rarely got watered and I never got around to laying the soaker hose. I had lost track of what variety I had been planting, so I decided it was time to start anew. 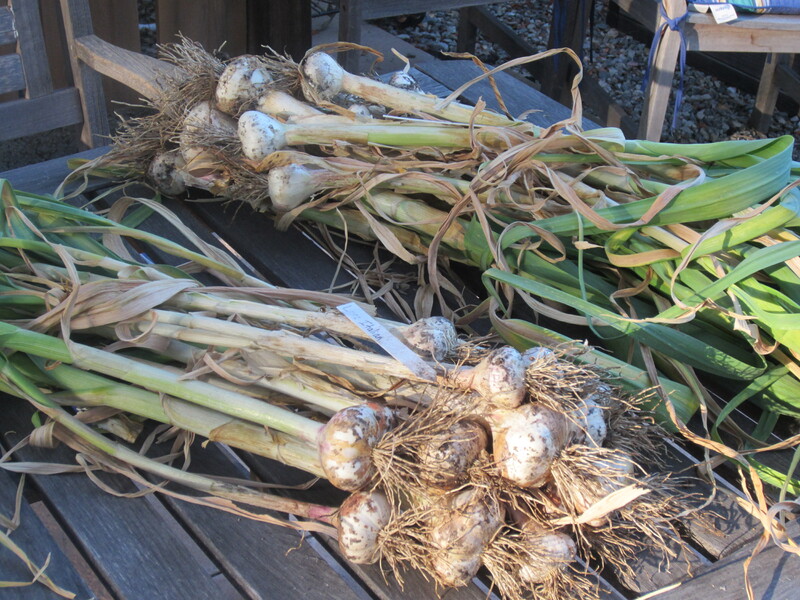 I harvested about 40 bulbs, 20 each of Lorz Italian and Ichelium Red. 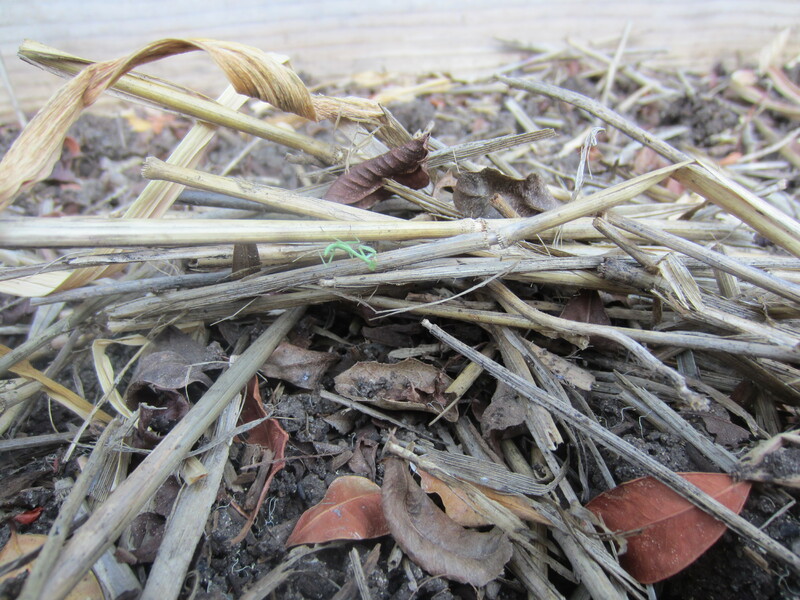 After the bed was clear, I sad down on the edge and spotted two tiny praying mantis babies. One is pictured here. Curing under the oak tree. Enjoying the vacant bed (still smelling of garlic). because I love reading your blog so much! Loved this post about your garlic. 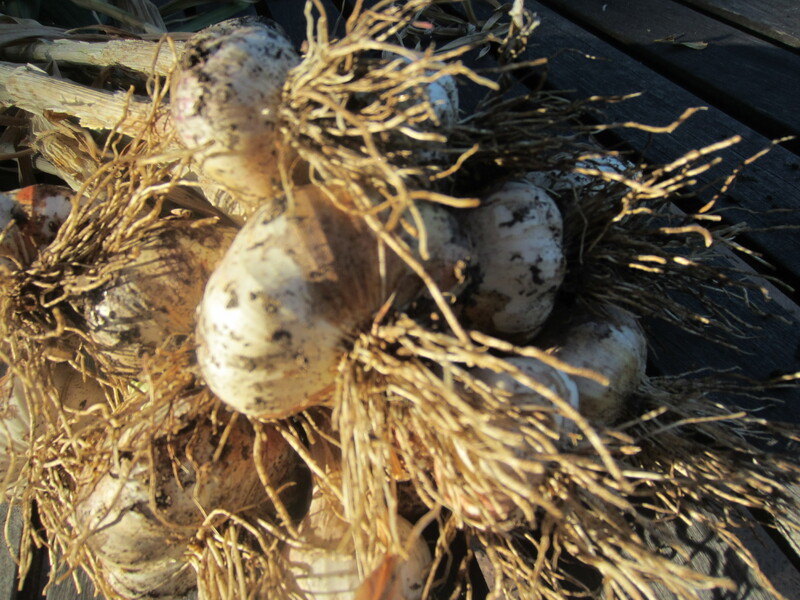 We are getting ready to harvest out garlic. This is the first time we have grown some. We are anxious to see how they come out. Thank you! How many bulbs will you harvest? 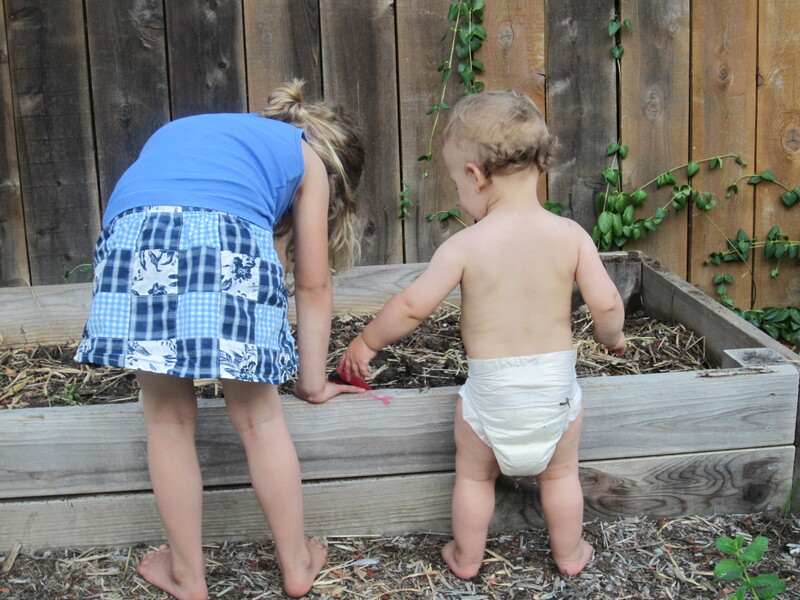 I have been planting garlic for 5 years now, and I can’t imagine a fall without putting them in the ground. Thanks for reading! Probably about 20 plants. I’ll post a picture when they are ready. How did you know when to pull your plants? This is my first year with garlic, and I have 9 plants. Here in the northeast I believe we harvest in July, but I would be curious how you know when to pull your plants. Hmmm. Several weeks before harvest, I check a couple of the bulbs for size. Just stick your finger in to remove some of the soil. When they are close, the bottom leaves begin to turn brown. I stop watering 3 or 4 weeks before harvest to let them dry a bit. Some of my smaller stalks were falling over at the time of harvest. Hope that helps!